When Gesean Lewis Woods was a child growing up in Los Angeles, the closest he got to having a pet was hiding a stray dog in his backyard and catching tadpoles in the Los Angeles River. His family did not appreciate his rescue efforts, however, and Woods was busted when the tadpoles turned into a croaking backyard chorus. But today he’s turning his love of animals into a possible future career, examining how friendships with animals might help people on the autism spectrum develop better relationships with humans. A master’s student in the Graduate College of Education’s Special Education program, Woods is one of this year’s 74 recipients of the California State University Foundation’s predoctoral scholarship, which supports the doctoral ambitions of CSU students at the 23 campuses, and one of 11 predoctoral scholarship awardees at SF State. Woods identifies as being on the spectrum and says he’s often more comfortable around animals than people. 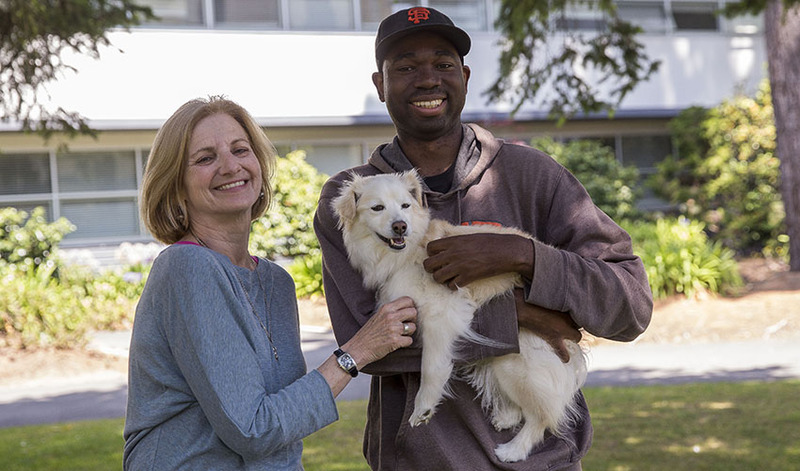 Last year he conducted a pilot study exploring that animal/human bond, and he plans to do more research investigating the ways pets help people with autism. “I want to learn what kind of social developments have taken place with people on the spectrum who have pets. And what hasn’t happened when there’s not a pet?” he said. Through his pilot study, Woods interviewed eight individuals from an autism spectrum support group, asking them four basic questions in addition to their age: whether they felt their pet has had any bearing on their relationships with humans; if so, how; whether they feel they have a friendship with their pet; and, if so, how that friendship manifests itself. While Woods let people define “friendship” any way they wanted, he defines it based on something he heard as a child: that the true measure of friendship is that no one keeps track of who owes the other person (or, in this case, living being) anything. “One of the things about a friendship with animals is that they can’t really ‘owe’ you; there’s just this natural response between you. You show your love to them and they show their love to you, and it becomes this mutual relationship,” he said. Six people in Woods’ study felt that their pets were true friends, and all of them acknowledged a mutual bond no matter what the species. (The subjects’ pets included frogs, cats, rabbits and dogs.) Many of the interviewees felt, like Woods, that animals were easier to be around than people. “Several people in the study brought up the lack of social expectations or verbal judgment with their pet,” said Woods. Woods is currently working as a therapist with children on the spectrum. He often sees younger kids initially try to be part of a group and withdraw only after being rejected several times. He thinks that having pets or relationships with animals could help. “A lot of people on the spectrum socialize pretty well when the cultural nuances and social judgment are taken away like they are with pets,” he said.